Here's a recording I came across in the stacks a few months back that I realized I'd never listened to (got quite a few like that!). 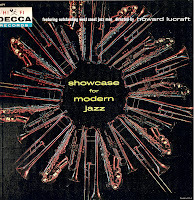 I'd judged it by its cover when I acquired it a few decades back, thinking it was just another attempt by a major label to sell "jazz" to a mainstream audience with syrupy arrangements and restrained soloists. Wrong. 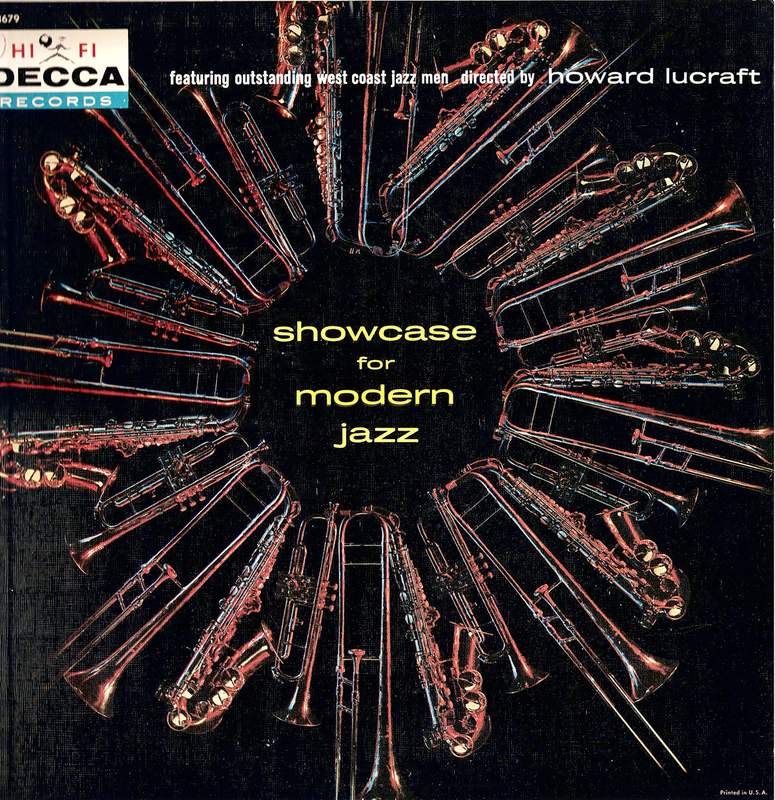 I'd never heard of Howard Lucraft, the album's arranger, composer and anonymous guitarist, before finding this LP. Despite my initial misgivings, he turns out to be a musician of some stature, and a very fine arranger/composer in the mainstream modern jazz vernacular. 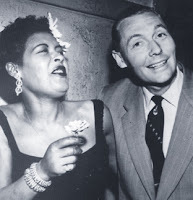 He also was an accomplished journalist, writing for jazz pubs like Down Beat and Metronome, a correspondent for the London Daily Herald and host of his own jazz radio and TV shows. 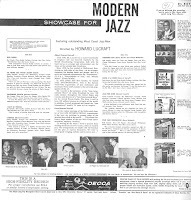 He was also a very fine photographer, mostly of other jazz players. A renaissance man, in other words. Born in London during the first world war, Lucraft arrived in Los Angeles in 1950 and decided to stay. He worked in the studios, wrote, composed, arranged, broadcasted and even played out a bit. 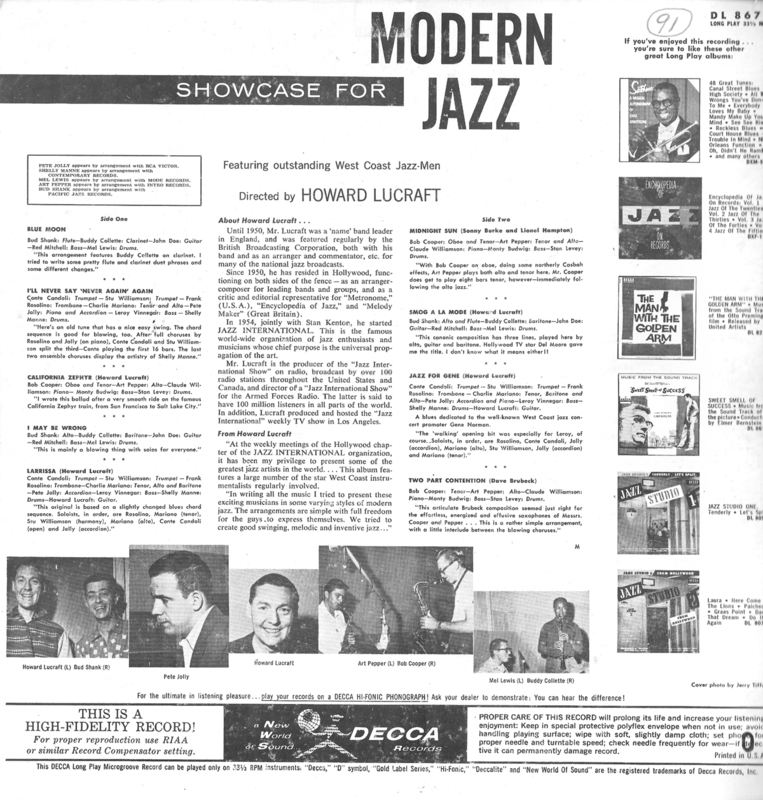 In '54 he hooked up with Stan Kenton and formed "Jazz International," an organization that promoted America's classical music worldwide. He even found time to make a few records. This album didn't set the world on fire, but it's a fine, swinging affair with very tasty performances from the cream of the West Coast crop in 1957. 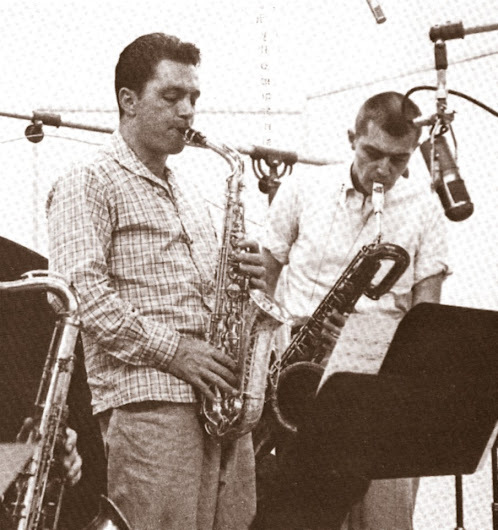 Present are Bud Shank, Art Pepper, Conte Condoli, Bob Cooper, Buddy Collette, Pete Jolly, Red Mitchell, Stan Levey, Mel Lewis and others. 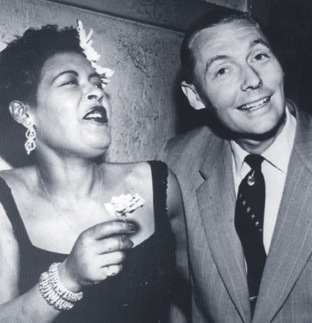 It's almost as though Lucraft and Decca hijacked a Pacific Jazz session for this date. While the results are somewhat less adventurous than a typical PJ recording, the performances are excellent, and Pete Jolly's accordion is an added treat. The guitarist isn't really John Doe, by the way – it's Lucraft himself. Chalk up another skill for the multi-talented Brit. This gem required no cleaning of sound, so what you hear is pure vinyl – taken directly from the original, of course.